This bear has had enough - say Goodnight Already! 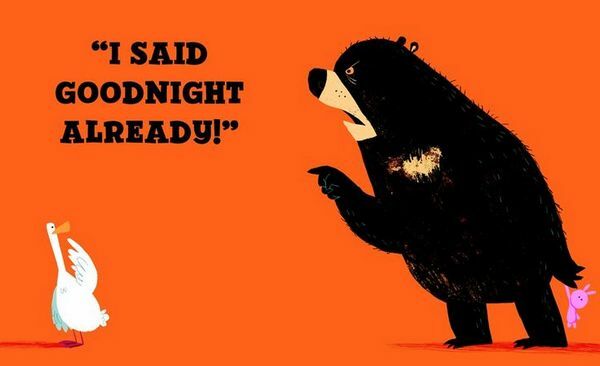 This bear has had enough – say Goodnight Already! Sometimes you’re desperate to go to sleep (okay, I’m always desperate to go to sleep). Sometimes there are little things that stop you getting to sleep (like toddlers). And you wonder how it is that your three-year-old had no energy to walk around the supermarket and yet at 9pm, is out of bed, ready to play? Meet Bear. He’s exhausted. All he wants is to go to sleep. Meet Duck, Bear’s persistent next-door neighbour. All he wants is to hang out… with Bear. 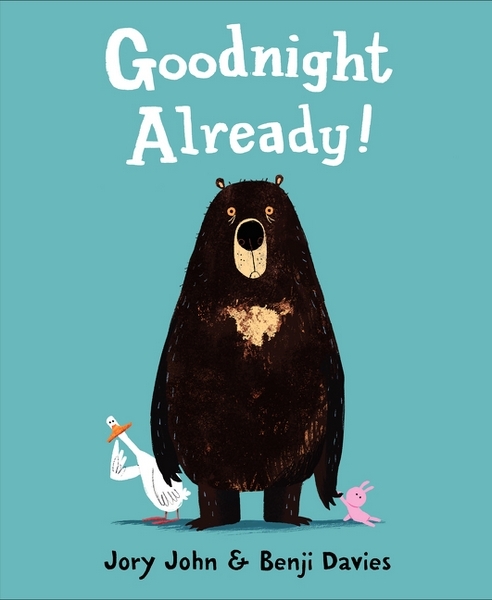 Bears and ducks, parents and toddlers – can you see the potential for hilarity in Goodnight Already! by Jory John and illustrated by Benji Davies? Bear is preparing for bed when the doorbell rings. It’s Duck. Duck is full of energy. In fact, he’s “…never been so awake”. Duck is also full of suggestions – “Wanna play cards?…Watch a movie?… Start a band?… Make smoothies?” Exhausted, Bear says no to each suggestion. He’s polite to begin with but Duck has a seemingly endless list of ideas (there is a brilliant illustration of Duck sitting in his brightly lit kitchen, sipping coffee and flicking through a book titled ‘101 Ways to Stay Awake’) and Bear’s patience begins to wear thin. John’s text is brilliant but it is the illustrations by Benji Davies that steal the show. Clearly Davies has nailed the brief, that being ‘draw a bear looking exhausted and exasperated’ and ‘create a duck that is endearingly annoying’ and the result is a superb contrast between the huge, grumpy Bear and a hyperactive pipsqueak in Duck. 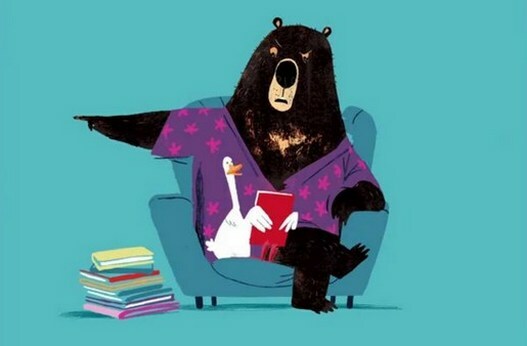 The details are endearing – Bear carries a little pink stuffed rabbit and wears a dressing-gown; Duck has dozens of costume changes; Bear has bags under his eyes; Duck looks hopeful as he holds up another book for Bear to read. The comic timing between the text and the illustrations is perfect – no mean feat given that words and pictures are inherently static. 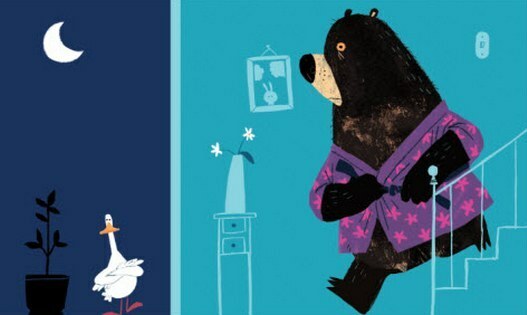 The ending is fitting and again, a scenario that parents know all too well – after countless interruptions from Duck, Bear is wide awake, the chance for sleep long gone. In contrast, all the to-ing and fro-ing to his neighbour’s house has worn Duck out and he’s sound asleep. Goodnight Already! is suitable for children aged three years and over. Find it online at Book Depository, which delivers free to Australia.